New Rochelle, NY, October 20, 2016-A new study has identified a mechanism used by tumors to recruit stem cells from bone and convert them into cancer-associated fibroblasts (CAFs) that facilitate tumor progression. This work, which pinpoints the specific biochemical pathways and cell signaling molecules involved in these processes, could lead to new therapeutic targets for suppressing tumor growth, as discussed in an article in Stem Cells and Development, a peer-reviewed journal from Mary Ann Liebert, Inc., publishers. 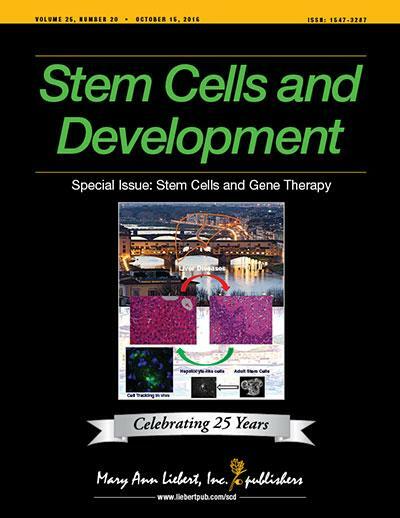 The article is available free on the Stem Cells and Developmenta> website until November 20, 2016. A team of researchers from China, led by Xue Yang and Xiong-Zhi Wu, Tianjin Medical University Cancer Institute and Hospital, and Tianjin Medical University and General Hospital, describe their results in the article entitled "bFGF Promotes Migration and Induces Cancer-associated Fibroblasts Differentiation of Mouse Bone Mesenchymal Stem Cells to Promote Tumor Growth." The authors show that breast cancer cells use basic fibroblast growth factor (bFGF) signaling to help them attract bone mesenchymal stem cells (MSCs) and induce their conversion into CAFs. They present evidence of the pro-tumor effects of stem cell recruitment and CAFs, primarily through their effects on the tumor microenvironment. "Here we have for the first time a mechanistic underpinning of how a tumor might recruit MSCs and induce their conversion to cancer-associated fibroblasts which then facilitate tumor progression," says Editor-in-Chief Graham C. Parker, PhD, The Carman and Ann Adams Department of Pediatrics, Wayne State University School of Medicine, Detroit, MI. "The crucial role of bFGF signaling provides not only a greater understanding of the process, but also suggests therapeutic targets." Mary Ann Liebert, Inc., publishers is a privately held, fully integrated media company known for establishing authoritative peer-reviewed journals in many promising areas of science and biomedical research, including Cellular Reprogramming, Tissue Engineering, and Human Gene Therapy. Its biotechnology trade magazine, GEN (Genetic Engineering & Biotechnology News), was the first in its field and is today the industry's most widely read publication worldwide. A complete list of the firm's 80 journals, books, and newsmagazines is available on the Mary Ann Liebert, Inc., publishers/a> website.